PLEXes are often a major topic on Market Discussions. Their seemingly endless rise attracts all sorts of opinions and speculation. 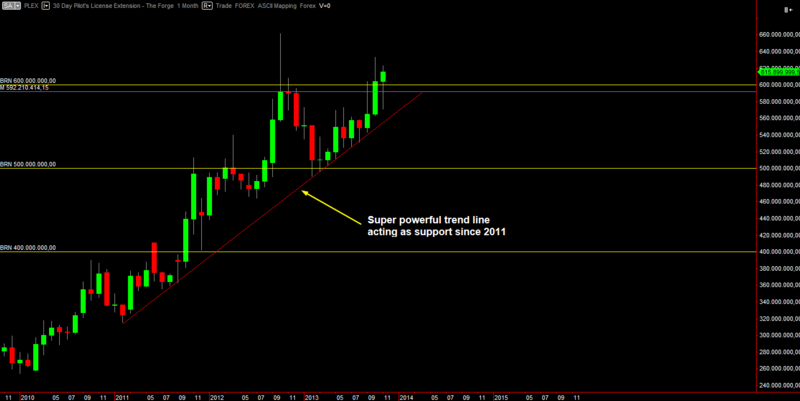 Price is still running above a massively strong trend line started back in 2011. The day it’ll get broken downwards, we’ll see fireworks. And tears, many, many tears. But as of now price is rising and heading towards the all time high of October / November 2012. If / when it’ll get to the high of that bar, that is up to 663M, then we’ll see fireworks as well. Price tends to strongly react at those critical places. I am not saying it’ll go up or down but that it’ll do it with great momentum, so keep on your toes! You have experienced the power of trend lines. It’s funny because it’s lasting since years, every time price gets down to the trend line something happens so that price does not break through but is bounched back up. I expected PLEX prices to go down around the end of Oct and they did. What surprised me is how quickly they rebounded again, especially with the Amazon pricing gaffe, the Somerblink cashout and a CCP PLEX sale all happening around the same time.